Known for his cool and sophisticated interiors, self-taught designer Jeremiah Brent has a way of bringing out the best in a space. When Jeremiah and his family moved to their new home, he had a fresh start to experiment with ideas and his home office was no exception. 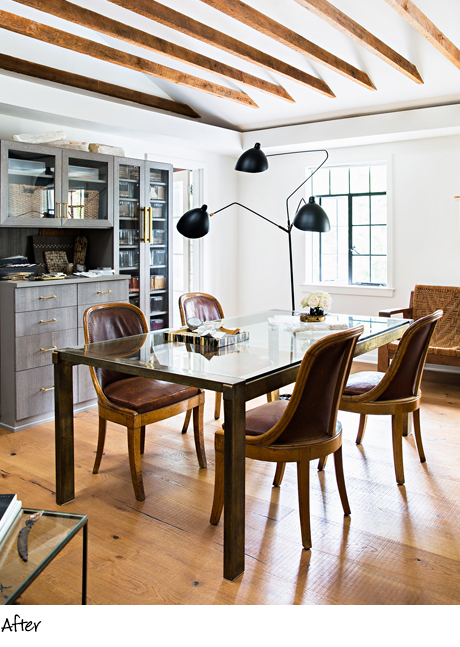 The home's back carriage house, intimate and flooded with natural light, would become the office oasis for Jeremiah and his team to collaborate and ideate in style. 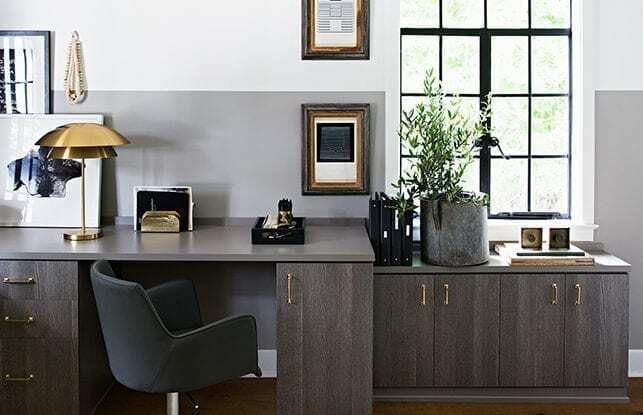 Working with California Closets Los Angeles design consultant Katharine Mills-Tierney, Jeremiah set out to create a custom cabinet large enough to house and organize his samples and supplies, as well as ample work stations for his team. Working with Jeremiah was seamless. His point of view and professionalism made him a pleasure to collaborate with. Jeremiah envisioned a specific color palette and chose Tesoro Ash and Cashmere to achieve the perfect tones of grey he was looking for. Working off an inspiration photo Jeremiah found on the California Closets website, Katharine created a striking custom cabinet that addressed all of Jeremiah’s needs, including the exact size of his design bins. The cabinet—a focal point in the office—featured framed glass doors, each accented by brass hardware Jeremiah sourced himself. For the work spaces, Katharine kept the desk areas simple and aligned with the shape of the room to create a productive flow. Each work station included a pop-up power station to streamline electrical cords. Watch the install in action! The team was incredibly easy to work with and was with us every step of the way. 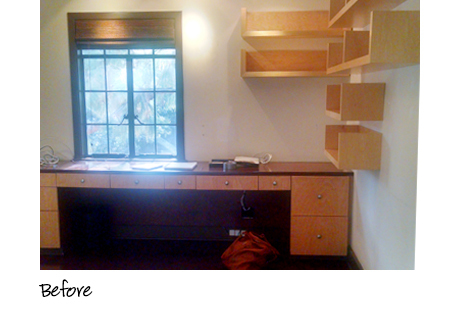 Working with California Closets made creating a custom office more attainable and efficient than I could ever imagine. 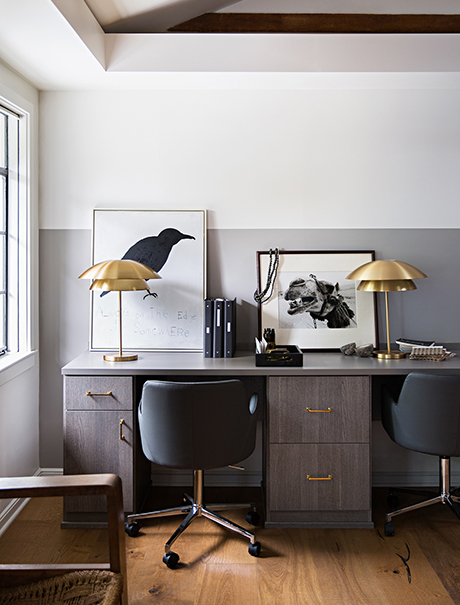 The transformed office is smart, chic, and efficient. Every detail—from the finishes to the flow—creates an inviting energy that echoes Jeremiah’s passion for design. 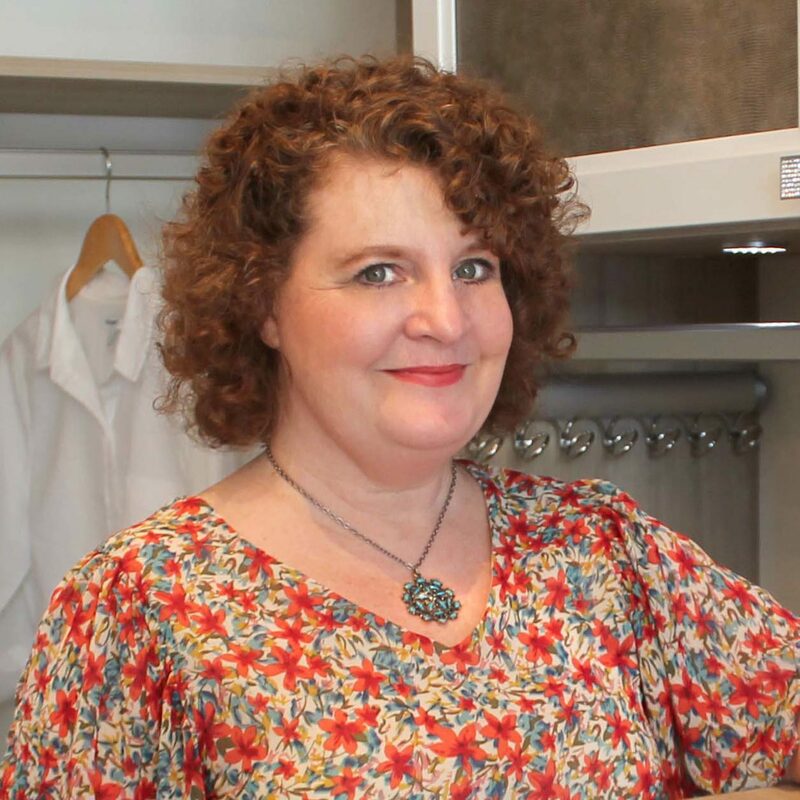 With plenty of storage and a thoughtful use of space, Jeremiah and his team can focus on their exciting projects at hand.